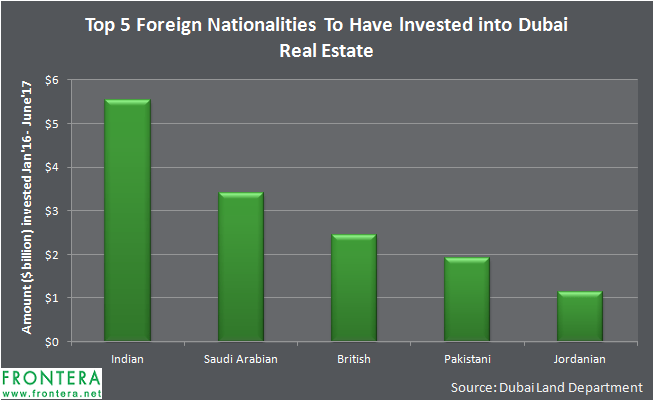 Which Foreign Nationalities Are Buying The Lion’s Share Of Real Estate In Dubai? According to data from January 2016 to July 2017, approximately 25% (about $10.2 billion) of the total $41.4 billion (151 billion dirhams) invested in Dubai’s real market came from Emiratis (UAE nationals) with the rest being invested by foreign nationals. 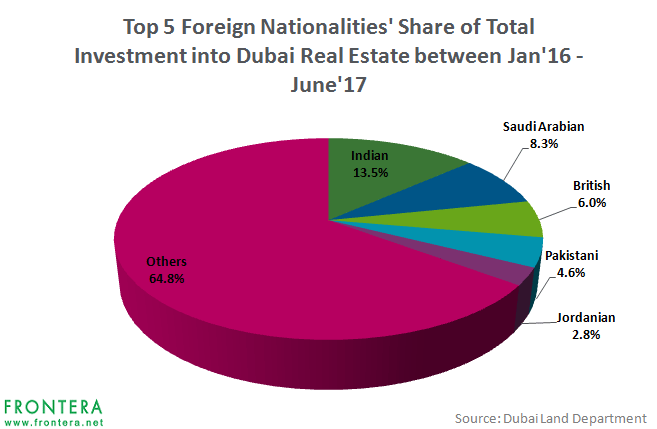 Investors from India (EPI), Saudi Arabia (KSA), UK (EWU), Pakistan (PAK), and Jordanians were the top 5 foreign nationalities invested in real estate in Dubai, with $5.55 billion, $3.4 billion, $2.45 billion, $1.91 billion, and $1.14 billion worth of investments made during the past 18 months, respectively. The share of Indians investing in Dubai’s real estate market is quite notable here. 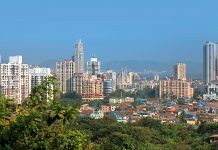 Of the total $41.4 billion invested in the market over the 18 months (01/16 to 06/17), 13.5% came in from India; second only to the locals, or Emiratis, which accounted for 25% of all investments. The economy’s market dynamism, quick transaction procedures, attractive tax rules (such as zero percent capital gain tax and no property tax), payment options, and higher rental yields, serve as the prime drivers for Indian investing in real estate in Dubai. 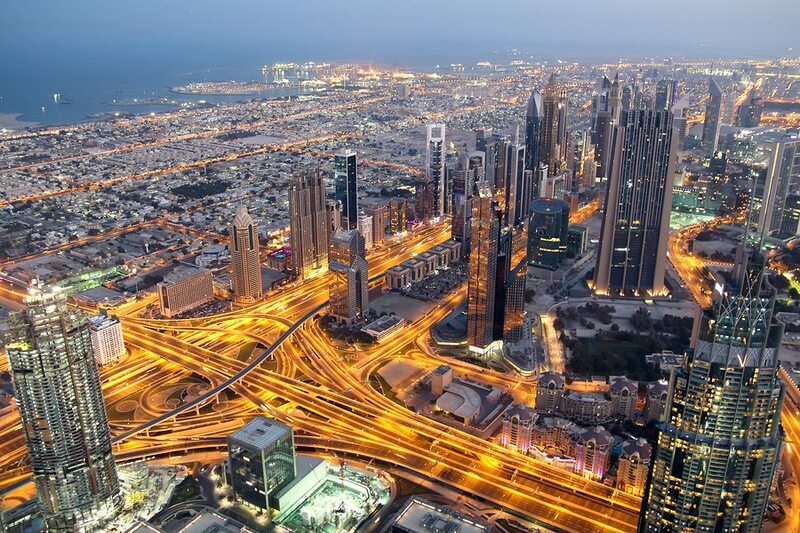 Saudi Arabians, British, Pakistanis, and Jordanians ranked next with approximately 8%, 6%, 5%, and 3% share of investments in real estate in Dubai, respectively. The Expo 2020, which is projected to bring in 25 million visitors, is expected to drive up tenant demand in the country. The upcoming implementation of a tax system, or VAT, is also expected to result in better payment plans for buyers of property in Dubai, driving up investment in the local real estate market. The recent Dubai Land Department (DLD) – UC Forward agreement should serve to drive up investments from Chinese investors, which currently account for just over 2% (ranked 8th) of aggregate Dubai real estate investment. 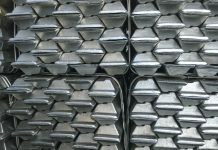 The agreement is a joint objective of securing approximately $270 million worth of investment from Chinese investors. From January 2016 to June 2017, Chinese investors poured close to $840 million worth of investments into Dubai’s real estate market. So, we may see Chinese investment in Dubai’s real estate market catching up with its other Asian (AAXJ) (VPL) peers. A study conducted on GCC home buyers indicated that 69% of respondents chose Dubai as the ‘go to’ city for real estate investment in the region, with 66% expecting the impact of Expo 2020 to increase property buyer interest in the UAE.